Thank you very much for getting all these data. Awesome, looks like Take Aim + Comp Mag is beast. This is an amazing job. does compressed mag was last chance in last event? and anyone know if high density plates nullifies the 10% + damage taken from cmpressed magazine? Great work, thanks for it ! However I tested Compressed Magazine and have it on a Kara plat (Kara + 4 Marksmen) (Compressed Magazine lvl4) for 2 weeks. They were killing instant everything BUT they were dying way too fast. I removed compressed magazine (and switch 2 marksmen for 2 heavy op - Kara still front) and thing work better. Bottom line: I wouldn't advise to use compressed magazine because every scratch the plat got is causing a huge amount of damages. 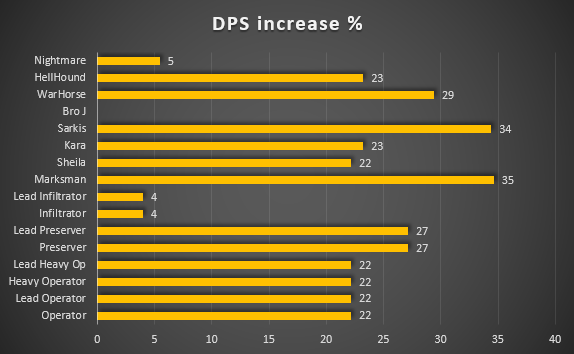 Bandolier doesn't change your dps of marksmen ? Impressive work. Unfortunately though the filters in this game still keeps us all like mushrooms growing in the dark. Group: Wolves of War (Inactive) but friends of many. Event/Mission Rewards: Not all but way too many to keep track of. Congratz MX36 You just took WrongThinkers thread to a whole new level of value to the players. Now we Need WrongThinkers Hidden Stats & your wonderful work Pinned, preferably in the Strategy section & without any comments attached. Players then have an easy point of reference ( It is a strategy game after all ) & any additions you guys can easily modify there & players can still comment on the 2 threads in General Discussion. Fortunately Compressed Mag. was Not a last chance in the last event. ♦ currently available as a Tier 3 shadow ops prize. ♦ will be available in the next event prize store. ♦ it might be added to the list of components you can replicate. it depends on the amount & type of damage you receive! it works against units that have higher ROF & low DPR, but some units can inflict a very high amount of damage in a single hit that the (-120 reduction) wouldn't help mitigate the damage. Marksmen are very efficient in taking out defenses, but their armor is thinner than paper! most of the repair time to my SF platoons goes to them. 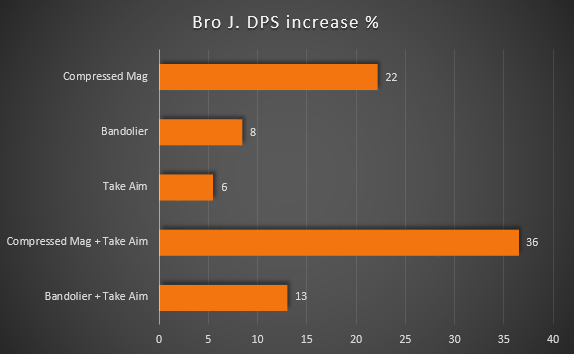 Edit: Added Bro J. DPS change with each component. note that i still have Not got a confirmation about his DPR @ level 20. but i used (4705) as the value instead of (4000). To save hunting for this thread is there any chance it can be pinned somewhere please ? Than Take Aim + Compressed Mag , Heavy Ordinance + Compressed Magazine Do Much Damage. Could You Clarify My Doubt . tell if my both calculations are wrong or right ?? i don't know which unit did you test in your example. but results will be different with each one due to varying DPR & RS. 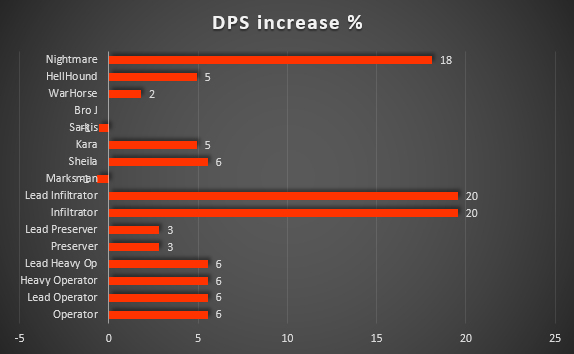 ♦ Heavy Ordnance will always increase your DPS. as it has no drawbacks affecting DPR, ROF or RS. 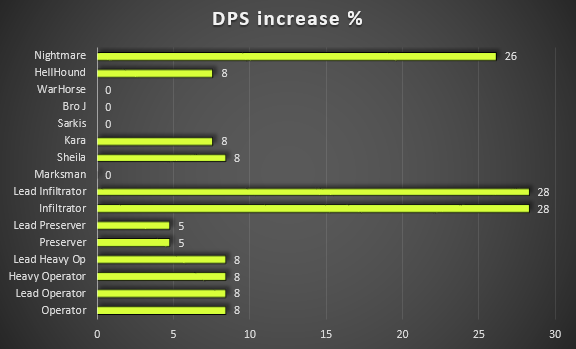 clearly the fisrt combo has more positive effect on the DPS than the 2nd one! This result will be different with other units. 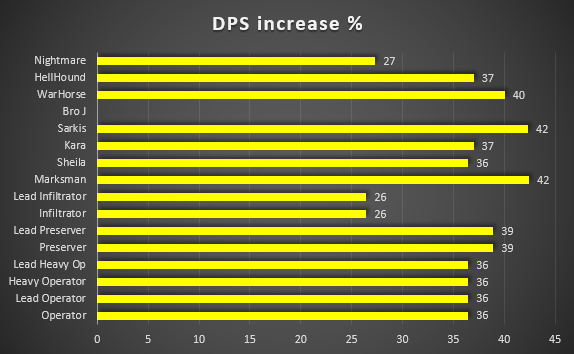 Im not sure if that formulas work or not but in my type of calculation i got some changes in dps for operators than yours !!! 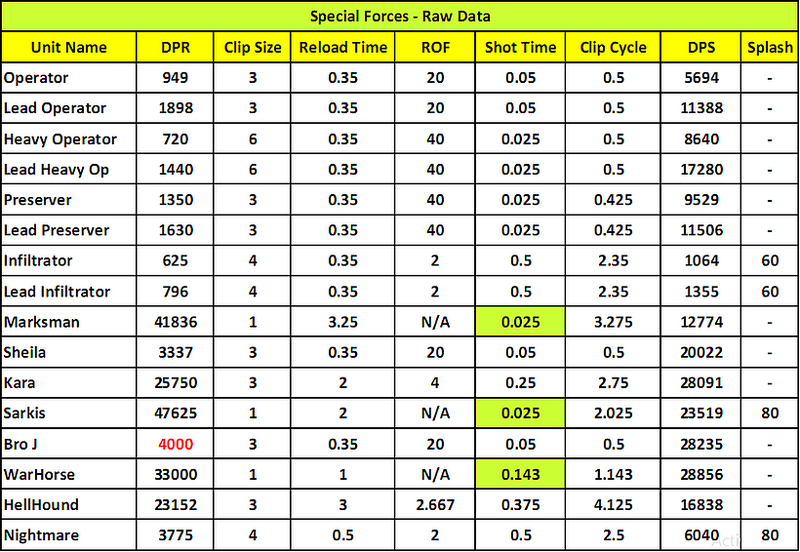 so for every 0.4475 seconds the clips are fired and reload is done . means for every 0.4475 seconds 4384.38 damage is done . in this tech design for every 0.3775 seconds the clips are fired and reload is done . so for every 0.3775 seconds 3701.1 damage is done . 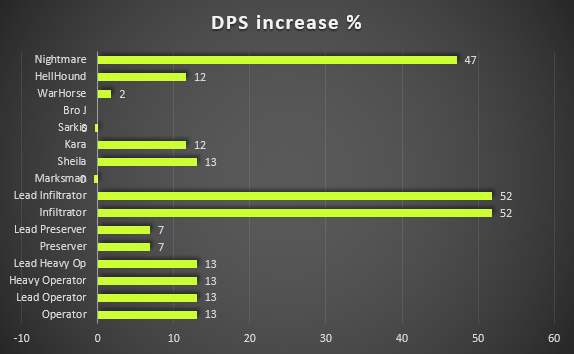 we have the same calculations, but i think the reload speed bonus is calculated in a different way! already asked about this in another thread waiting for replies from [WrongThinker] or CMs.